The thing I’ve really noticed after working downtown for a few months is there is not a lot of grab and go places for lunch. There are a lot of great restaurants and lunch deals, but I’m not really an office worker who actually gets to take an hour lunch break everyday. I’m lucky most days if I have time to grab a sandwich as I run out the door. 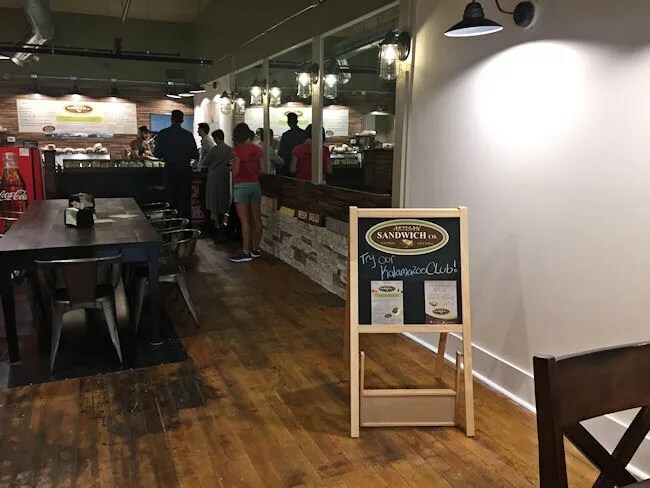 We’ve been pretty frequent flyers at Irving’s Market and Deli and Totally Brewed Cafe because both places are quick and have mostly healthy take out options, but now a new place has opened up on The Mall that will give us another option. 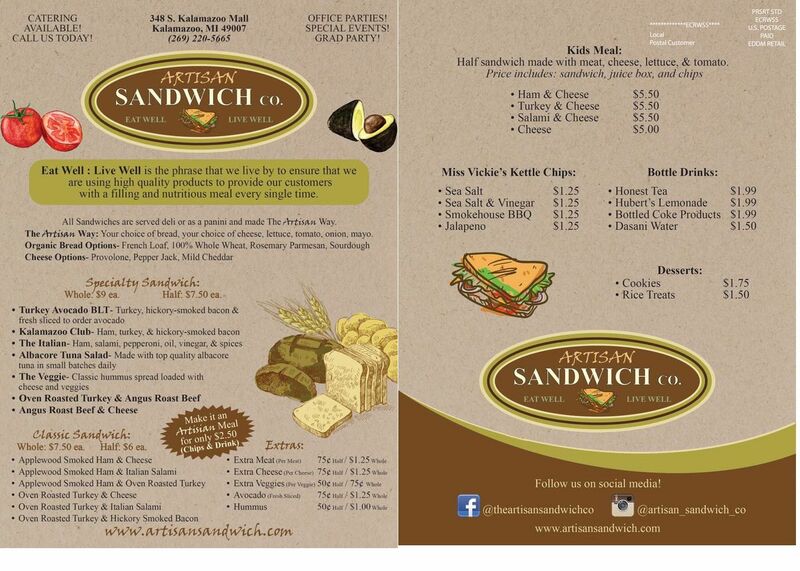 Artisan Sandwich Company is in the Peregrin Square building on The Kalamazoo Mall north of Lovell. 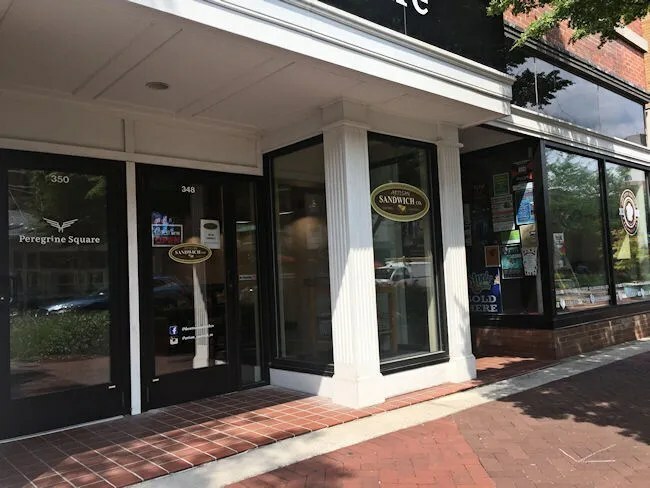 The space that the restaurant now occupies was Exquisite Hair Designs right next to Pop City Popcorn. The restaurant isn’t very big, but it’s a sandwich shop, so it doesn’t need to be. The space is long and narrow with a couple of tables filling in the gap between the door and the order counter which is in the back. There are only two tables in the space that sit on the weathered hardwood floor. 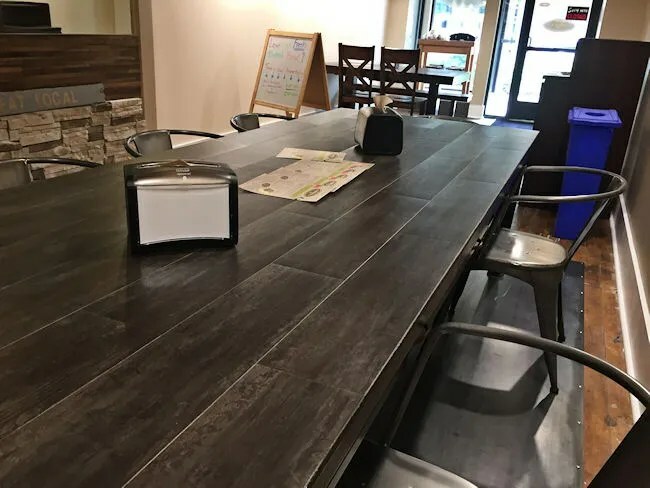 The big one is a community style table that seats ten. There is also a smaller table with a couple of seats around it near the entrance. The order counter is an upscale version of a typical sandwich place. There’s a cash register at one end and a pick up area at the other, but you’re not going down the line and adding ingredients Subway style. 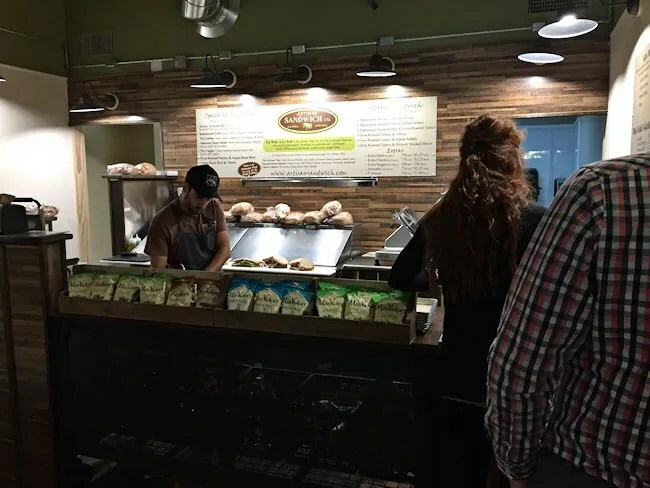 There is a little bit of customization you can do on each sandwich, but for the most part, the sandwiches are set by the menu which is hanging on the wall behind the employees. We caught the shop at a crunch time not too far after 11:00 on a Thursday afternoon. There were only two people in front of us, but they had just gotten a big to-go order in and there was only one person working. He was working fast and apologizing the whole time. The people in front of us were IT people so they knew how the iPad point of sale system worked and typed in their own order so he could go seamlessly from his to-go order to their order to keep things moving. For as swamped as he seemed to be, we only waited about five minutes or maybe a little longer to put our order in. We had a co-worker visiting from Grand Rapids and she offered to buy us lunch. I ordered The Italian on the French Loaf. 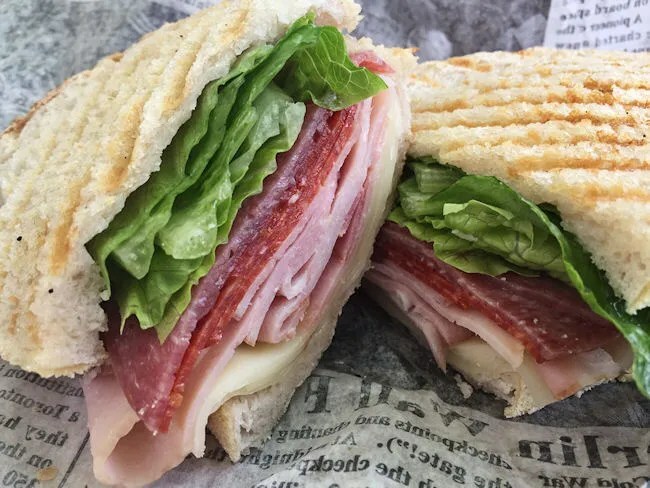 The sandwich is ham, salami, and pepperoni that is cut fresh when they need it alongside Provolone cheese, vinegar and spices. The sandwiches all come “The Artisan Way” which includes lettuce, tomato, onion, and mayo. I left everything except the lettuce off mine and had it toasted to make a panini. The lettuce is the part that really jumped out at me. It was crispy and fresh. It’s not often that a veggie separates itself from the meat in a good way on a sandwich for me, but this one did. The meat was piled on pretty thick and the toasted french roll had a perfect crispiness to it that soaked up the oil and spiciness from the meats. My co-workers each got whole speciality sandwiches as well and we all three got bottles of Coke. The total came out to right around $30 for the three of us and the sandwiches took a little over five minutes to make. We were going to walk back to the office to eat but ended up grabbing a table outside on The Mall. 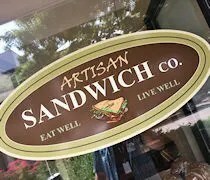 The Artisan Sandwich Company is such a great option for a quick, delicious, and healthy lunch downtown. The thing that I’ve really enjoyed about working downtown is being able to walk around when I can find times for a break. This shop is a couple blocks away from where I work but it’s a short walk we’ll be making time and time again.